Did you know that 40 percent of the food produced in America isn’t eaten, and an estimated half of that waste comes from households? 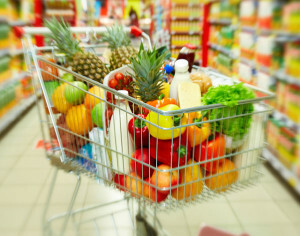 Take a quick mental inventory of the food you purchased on your last shopping trip. Did it all end up on your plate or in your belly? Chances are, probably not. Food waste is not intentional, but nevertheless a very common occurrence in households. In the United States, it adds up to about 20 pounds per person, per month — that’s $1500 worth of food each year a family of four tosses. But food waste isn’t only a waste of money, it’s also a waste of natural resources, which puts unnecessary strain on the environment. Shop smart. Only buy what you know you’ll use. Create a meal plan for the week and build a shopping list around that meal plan. Try using this meal planner from Eureka Recycling, or the EPA’s smart shopping list (PDF). Eat food strategically. All produce has a varying shelf life. Vegetarian Times provides a great explanation of why some veggies and fruit go bad before others, and offers a handy chart to help you plan your week. 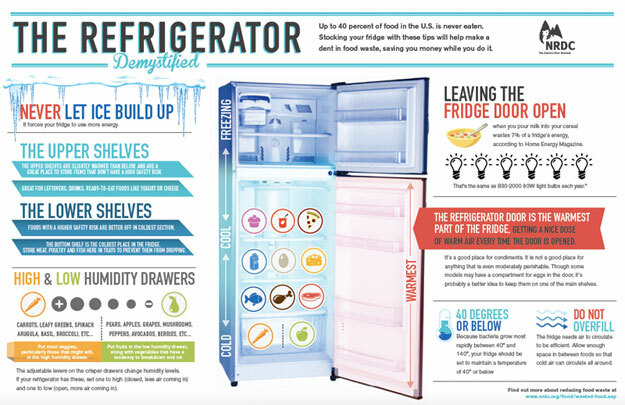 Try labeling your food to remind yourself which items need to be eaten first (such as with these handy signs from the EPA), and freeze food that’s about to go bad so you can use it in the future. Still having trouble eating food in time? Try the USDA’s FoodKeeper application for Apple and Android devices. It provides expert-backed advice for storing and eating more than 400 foods and drinks, and can give you reminders to use items before they go bad. Prepare food in advance. When you get home from the store, rinse and chop your produce so that snacking and meal prep is easier during the week. That way you’ll be more likely to follow through on making the meals you shopped for. Don’t take sell-by or best-by dates as gospel. There are no standards for these dates, which are largely meaningless (read more in this Washington Post article). To learn more about how long you can keep food, visit StillTasty.com or EatByDate.com. Have a fridge full of random items? Use an online tool to help you find recipes for them, such as Supercook or MyFridgeFood. Make food scraps reusable by creating a compost in your backyard. If you don’t have yard space, try making in a worm bin. Have a garden? Get connected with Ample Harvest, an organization that connects food growers with food pantries, so that extra produce can feed those who need it. Get educated and motivated. Learn more in this video, or check out SaveTheFood.com or Sustainable America’s website I Value Food for more awareness-raising statistics and lifestyle tips.